Baby Bloopers: A “Cheesy” Gift for Mommy! | Sass a Craft - Muslim Women are Smart & Crafty Too! 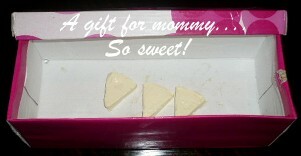 Baby Bloopers: A “Cheesy” Gift for Mommy! My daughter loves to do nice things for me such as washing my cell phone so that it’s squeaky clean (rendering it useless…lol), a hug and kiss “just because,” or feeding me a snack with slobber all over it, yum! What a darling. She came to me one day wearing a huge smile holding something behind her back. She told me that she loved me and handed me this wonderful gift! Awwww, sniffles. lol… awww, what a sweetheart masha’Allaah tabaraka’Allaah. May Allaah protect our children and make them among the righteous ameen.